When you’re a tie-in novelist, you’re always going to lag behind the TV show you are writing about. 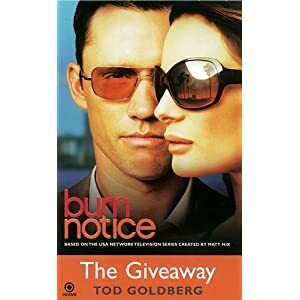 That’s certainly the case with Tod Goldberg’s The Giveaway, based on the USA show Burn Notice. His book has the unfortunate luck to use Biker gangs and Safety Deposit box robbing, both of which have played large roles in Season 4 episodes that weren’t a glimmer in the show producer’s eye when this book, just released, was written at the end of season 2. Burn Notice revolves around a Michael Westen, spy who has been “burned” by his bosses and left to pick up the pieces on his own in Miami. Although recent episodes have made certain aspects of “The Giveaway” redundant, Goldberg does a great job capturing the unique voices of the different characters on the show and giving them a fun little case to work. Burn Notice uses its lead character voice-overs to good effect and that lends itself to a first person book. The only moment the book falters are the few times the book strays from that first person narrative and in a surprisingly lackluster ending. Last words: If you enjoy the show, this book is a fun diversion that will get you through those long months before the new season starts. Serious spy fans will want to take a pass.